During a visit to Indonesia in October of 2004, I was trying to make the most of my last day in the country. After a week in the relative calm of East and Central Java, where I had toured with the Kiai Kanjeng ensemble, the return to Jakarta assaulted my senses. Although I had lived there for two years (1995-96 and 1999) and had returned for shorter visits on several occasions in 2003 and 2004, the intensity of the traffic seemed overwhelming after traveling around the Javanese provinces. I was hoping to be on time for a gathering of alumnae and teachers from the women's college, Institut Ilmu al-Qur'an (IIQ), who were commemorating the death of Ibrahim Hosen, the founder and former director of the institution. Part of the memorial gathering, I was told, would be the collective recitation of the entire Qur'an. Khatam al-Qur'an, as performed in this particular setting, entails the recitation of the entire Qur'an by thirty reciters all at once. Although I had heard khatam al-Qur'an before and had recorded it in 1999 at the home of Ibrahim Hosen, the wonderful cacophony of thirty voices, each one reciting one of the thirty parts (juz') of the Qur'an in a fast melodic patter, was something worth witnessing again. I made my way to Ciputat in a taxi from Depok, where I had met with some singers that were part of an Islamic music festival.
" ... spoken English ... "
" ... video conference ... "
" ... native speaker ... "
" ... just a few minutes ... "
Although many consider me fluent in Indonesian, and I can usually make myself understood, cultural knowledge, or the ability to understand what is going on in a particular situation, when processed through the filter of Bahasa Indonesia, the Indonesian national language, often reveals itself to me in bits and pieces, particularly in a socially dense setting (as opposed to a one-on-one conversation). We mingled a little more, and Ibu Maria once again tried to explain what it was that she wanted me to do. I still had a few appointments in Jakarta that afternoon and evening, and I should have been on my way, but spending just a few more minutes at the gathering seemed harmless enough. Inevitably, one of the things that researchers can offer the communities within which they work is knowledge of the English language. However unglamorous it may seem to the anthropologist in search of more meaningful engagement, teaching English, translating the local spoken language into English and vice versa, reviewing translated documents, fixing the grammar and syntax of English song lyrics penned by hopeful songwriters, and various related tasks are among the valuable commodities of exchange that we can, and that I could, offer to our hosts in the field. Although at the outset of this project, in early 1996, I initially resisted the role, I had become accustomed to the request to provide services as an English-language specialist. We moved from the living area of the house into one of its wings, which Ibrahim Hosen's daughter, Nadirsyah Hosen, explained they maintained as a library. A long table was piled high with materials, mostly photocopied articles and notebooks; several metal bookcases occupied the center of the large space. There was a white board and markers, a couple of computers, and a television, which was on, although no one seemed to be watching it. A cart containing a sound system was rolled into the library and a microphone was produced. I was still under the impression that someone wanted to videotape me speaking English so that students could study the pronunciation and cadence of a native speaker. But the task at hand was far more interesting. Several of the college students at IIQ were involved in an international forum that was to be held by videoconference in just a few days among female college students in the American Midwest and those in the Muslim world. The students had been preparing position papers that addressed American power, foreign policy, global security, and the war in Iraq. Among their questions were: Was America's export of democracy appropriate for all countries? Was it appropriate for America to police the world? What about preemptive strikes? What kind of a message do they send? What about the American government's disregard for the United Nations' rules of engagement and war? What about the enormous economic and cultural influence that America exerts on the world? All of these specific issues related to a larger and more speculative topic: "The Role of Women in Foreign Policy." The young women were well prepared. They had taken on this work as an independent study under the tutelage of Nadirsyah Hosen, and their photocopied articles in English were marked up with translations and notes. After they turned on the microphone, the first student read her position paper on preemptive strikes and why Muslims have bad feelings toward America. She was poised and her pronunciation was generally excellent. The second read from a document that was not as well written but still did admirably. They then brought out a tiny portable cassette recorder to capture my comments. I thought it best to reread their documents aloud and suggest alternate phrasings where appropriate. As I clearly pronounced the titles of the students' pieces, I found myself completely overwhelmed by a bundle of emotions. My throat tightened as I swallowed hard and tried to keep my composure. These young women, all of them students at an institution that may appear (to both Westerners and Indonesians) to promote conservatism and conformity veiled in the authority of an androcentric religious cultural system, were in the eye of the stormy questions of the day. These questions, although they may have been nascent when I began visiting this college for qur'anic studies in December of 1995, had none of the implications that that they did on this day in October of 2004. The United States was enveloped by the post-9/11 culture of fear; in Indonesia, three terrorist bombings (in Bali on October 12, 2002; in Jakarta, at the Marriott Hotel, on August 5, 2003; and at the Australian embassy, on September 9, 2004) tarnished the image of Indonesia in the eyes of the Western world, reducing tourism by six million per year and preventing even students and musicians from acquiring visas to the United States. We were all victims of the preemptive American war in Iraq. As I had traveled nonstop around Central and East Java and Jakarta the past several days, it had seemed to me that everyone was pleased with the results of the recent democratic and direct election of President Susilo Bambang Yudhoyono, often referred to as SBY (pronounced ess bay yay), in an election that had been held on September 20, 2004, just a few weeks prior to my visit. Eighty percent of the population participated in the voting process peacefully and without incident. The election, although not an automatic guarantee of reformasi, the reformation that was supposed to follow the thirty-two-year tenure of the autocratic president Suharto, provided some hope for political stability, a better economy, security from Islamic extremism, and reduction of "korupsi, kolusi, dan nepotism" (KKN, pronounced kah kah enn), or "corruption, collusion, and nepotism," which, many believe, continues to impede the country's progress. The election of Yudhoyono as the fourth new president in six years was certainly proof that, at the very least, a democratic election process was on solid ground. My own obsession in October 2004 was, of course, with the final laps of the race between John Kerry and George Bush for the American presidency, a contest that would inevitably have ramifications not only for me but also for the young women I was coaching. As an American in Indonesia it is impossible, even in the most fleeting and informal of exchanges, not to engage almost immediately in the political realities of our contemporary world. As someone who has spent considerable time in Indonesia, I find it difficult not to address the stereotypes and fears that many Americans have about Islam, Muslim Indonesia, and Muslim women in teaching and public presentations. Although I am essentially a researcher of cultural ritual and musical expressions of Islam in Indonesia, the political periphery inevitably became central to the project. This book is about Islamic performance in Indonesia and the roles that women play in the expressive and ritual culture of religion. The book is organized into six chapters. Following this introduction, chapter 2, "Hearing Islam in the Atmosphere," describes the soundscape of a cultural-religious sphere that emanates from and broadcasts to various realms of Indonesian society. The third chapter, "Learning Recitation: The Institutionalization of the Recited Qur'an," illustrates student-teacher relationships in a variety of contexts of teaching, practicing, and experiencing the recited Qur'an. Chapter 4, "Celebrating Religion and Nation: The Festivalization of the Qur'an," describes the religious festivals and competitions that reward and encourage Islamic performance as an act of civic duty and patriotism. In chapter 5, "Performing Piety through Islamic Musical Arts," I look at the various strains of Islamic musical arts-from devotional song to multimedia performance and commercial production-that occur in the contexts introduced in the first four chapters. 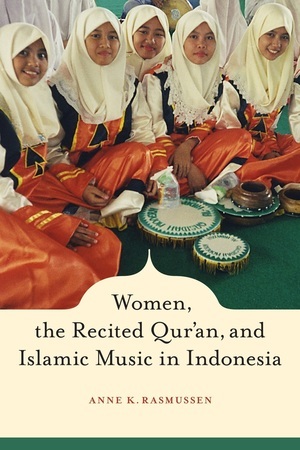 Chapter 6, "Rethinking Women, Music, and Islam," focuses on issues of gender and religious practice by revisiting many of the people and events introduced throughout the ethnography and by evaluating issues of motivation, agency, and access in light of the literature on women in Islam, and on music and gender, and by taking into account the activist voices of Jakarta feminists. As an ethnomusicologist I am concerned with sound, how it is generated and experienced, and the kinds of aesthetic and literal meanings that it generates. Music and musical performance are rich fields for interpreting both the ongoing Islamization of the archipelago and the indigenization of the religion in the region. Women are clearly players on the stage of Islamic creative and performing arts. Their activities as qur'anic reciters, moreover, in the culture of the Qur'an as it is lived in Indonesian, are indeed a distinctive feature of this region, where the word of God is embodied and enacted by women. Encoded in the sound of the recited Qur'an, considered to be something of exquisite beauty in and of itself, is its meaning, a phenomenon to which Indonesian women also have access. Knowledge of and about Islam through its texts is something that has always been associated with a learned elite in Indonesia. I contend that women, because they are so active as reciters, are part of that elite, even if they are only producing the message to be interpreted by others. In many cases, however, women are reading, reciting, questioning, and teaching these texts on a variety of levels, even if it is by their own example as devout working women rather than distilled into formal lessons or prepared messages. Pieternella van Doorn-Harder's recent work on the women of the two largest Muslim social organizations in Indonesia has contributed definitively to my sense that women contribute significantly to the study and interpretation of Arabic texts that have been considered authoritative in Indonesia for at least five hundred years. That they develop the skills to delve into these texts in Arabic-a language that is not accessible to most Muslims, except as ritual performance-means that they also are developing a proclivity toward questioning texts in Indonesian or even English, as the young women were doing in the opening scenario of this chapter. Since Indonesian independence in 1945, the political climate in Indonesia has enabled an increasingly favorable context for the performance of Islam. Although the New Order of Suharto, president of Indonesia from 1967 to 1998, eschewed even the idea of an Islamic state, religious belief, albeit accommodating and pluralistic, was conceived as one of the five pillars of Pancasila (or Panca Sila), the guiding paradigm for Indonesia. Yet as Suharto's thirty-two-year tenure progressed, his outward expressions of piety became characteristic of his reign. Contemporary scholars have remarked that Suharto's post-1965 New Order government (Ordre Baru) promoted Islamic practice in order to gain political support from Muslims without moving toward a scripturalist interpretation of the religion as a blueprint for civil life (Madjid 1996; see also Abdurrahman 1996 and works by Hefner and Federspiel). Just one of the signals of the promotion of Islamic practice in the public domain is the way in which the speech of officials-from politicians to teachers, and from radio disc jockeys to news anchors-is peppered with Islamic greetings in Arabic, a marker that assumes a common denominator of religious affiliation and piety. The required greeting in a formal context is "Assalamu alaikum wa rahmat-illa Allahhi wa barakatu" (peace be upon you and the mercy of God and his blessings). Officials and community leaders, however, often continue their acts of language showmanship, if they are able, with several additional lines of formulaic and pious Arabic speech. The embrace of Islamic culture in the public arena has intensified religious life among all classes, most notably among the elite. For example, reflecting on his experience as a tour guide for Haj Plus, a deluxe package tour for the haj, or pilgrimage to Mecca, Abdurrahman writes of the middle and upper classes as groups seeking religious and social identity through Islamic practices quite distinct from those of their peasant countrymen (Abdurrahman 1996, 117). "Pilgrimage Plus" tours include five-star hotel accommodations, shopping excursions, and spaces in which pilgrims can indulge in non-pilgrim-like behavior, such as smoking and wearing makeup. Other relatively new practices, apparent among Jakarta's middle and upper classes, include the adoption of varied styles of veiling and Muslim fashion among women from many communities. Busana Muslim or busana Muslima (Muslim clothes or fashion, particularly for women) is now a big business for designers and forms a separate department in most clothing stores (see Tarlo and Moors 2007; Smith-Hefner 2007). Islamic music, formerly heard in ritual contexts and only among particular constituents, is now created and produced by the stars of the mainstream media and broadcast in five-star hotels and shopping malls. And religious music videos may be seen daily on many television stations and almost continuously during the month of Ramadan. Government-sponsored celebrations as well as competitions in qur'anic recitation and related arts "festivalize" religion in acts of nation building that appeal to national and local governments, commercial sponsors, and an interisland viewing audience that cuts across socioeconomic class. In spite of the rigorous policies of censorship that were in place during Suharto's tenure, evaluating of the effects of the so-called "guided democracy" of Suharto's New Order has become a national pastime. One recurring theme among Suharto's international cadre of analysts, in the press, in academia, and even on the street, has been the escalation of religious practice since the latter part of Suharto's New Order and continuing through the 1990s. As the subsequent period of reformasi unfolded, the position of the various post-Suharto governments regarding religious practice and government support of religious activities and institutions was also a subject of speculation and critique. In fact, anticipating and evaluating the changing presidential guard-from Suharto to B. J. Habibie to Abdurrahman Wahid, then to Megawati Sukarnoputri and finally to S. B. Yudhoyono-during the period of my ethnographic research (1996-2005) has been a productive catalyst for the discussion of government patronage and its intersection with religion among myself and the many consultants who have taught me about their lives and concerns. Although establishing clear relationships between the policies and rhetoric of the government, their effects on religious life, and people in the profession of religion is impossible, a dynamic theater of government and its patronage of, or reaction to, all things Islamic is a great source of speculation, evaluation, and debate. My project came to focus on the culture of the recited Qur'an, the Islamic music I heard in contexts where the Qur'an was performed, and the ways in which a variety of participants, especially girls and women, are involved in this performance complex. Even my first explorations revealed that this is a culture that is created and shared by women and men. Indonesian women and men are recognized throughout the Muslim world for their skills as reciters, particularly in the Egyptian melodic and performative style, mujawwad, or, as it usually called in Indonesia, tilawa. Connected to and overlapping with the culture of qur'anic performance is an array of Islamic music, some of it rooted in distinctly Indonesian traditions and some of it displaying the features shared by other Muslim communities, many of them newly generated, in which women and men participate equally. My initial inquiry concerned the ways in which Arabic musical aesthetics and techniques were imported, theoretically beginning as early as contact was made with Muslim peoples over the well-worn trade routes of oral tradition and then either preserved or reinvented. The introduction and maintenance of an essentially foreign system of musical techniques and Islamic aesthetics, many of them grounded in the Arabic language, in a cultural region renowned for its gong-chime ensembles and collective interlocking musical techniques is a phenomenon that has been largely underanalyzed in a vast literature on Indonesian music. Although musical aesthetics, instruments, and techniques may be traced to Muslim communities from throughout South and Southeast Asia, I discovered that the mechanisms for teaching and learning this specifically Egyptian and essentially musical-linguistic practice had been institutionalized only relatively recently in postindependence Indonesia, albeit almost exclusively through oral praxis. In the course of this original inquiry I learned something about the power of sound. Qur'anic Arabic, the intervallic structure and special intonation of Egyptian melodic modes (maqamat), the timbre of nasality (ghunna), the extension of syllables or even unvowelled consonants (madd) that enables dramatic melodic and melismatic flourish, intense vocal production, extreme range, and the predictable rhythm of a familiar, if variously understood, text all reference an Islamic ideal. In doing so, these musical conventions allude to the original sites of Arab Islam with multisensory efficacy, both for those who practice and participate in Islamic ritual as well as for those who do not. Thus, the sound of the recited Qur'an indexes much more than literal text or religious tenets. It is a sonic and symbolic package of cross-cultural histories and relationships as well as a signifier of contemporary identity and practice. Islamic sound arts, which encompass language performed in a combination of Arab and local musical styles, is referenced and invoked variously in all kinds of Indonesian Islamic music, where, I suggest, it also operates as a summarizing symbol of spirituality, history, and identity. Although scholars who focus on the many indigenous traditions of Southeast Asia-traditions of music, dance, material arts, ritual, and theater-may be surprised at the enumeration of Islamic arts, scholars of the Middle East and of Islam may recognize many descriptive points that resonate with their own experiences in Muslim contexts throughout the world. This work is not meant to be comparative or to evaluate the presence, continuity, or change of Muslim expressive culture in Indonesia vis-à-vis other communities in the Muslim ecumene in any comprehensive way. Rather, my intent is to describe the way in which Islam-inspired "performance" occurs among the communities of professionals and amateur men, women, and children in this largest Muslim and also democratic country. Although infamous in the West for its strict regulation of musical activity, the religion of Islam, with its obligatory rituals and cultural traditions, actually generates and contributes to an international Muslim music culture. Frequently depicted as a homogenous people, Muslims have been mischaracterized in the popular imagination of the contemporary West as music-phobic, in part because of their regulation of musical activity in various contexts and historical periods up to and including the present. (For more on this topic, see the works by Sawa, al-Faruqi, Lambert, Shiloah, Nasr, Farmer, Danielson and Fisher, and Baily). Rather than being excised from religious and social culture, however, musical techniques and aesthetics, particularly those involving the performance of the Arabic language, are in fact preserved and promoted throughout the Islamic world community (umma) through the melodically recited Qur'an and a multitude of devotional and ritual practices ranging from prayer to song. The aesthetics of Arabic music, then, transmitted through the recited Qur'an and other religious musical genres, are carried through time and space encompassing what Monson, in her work on African and African-American musics, might call "global riffs" (Monson 1999). I came to recognize that an Arab music style such as it exists in qur'anic recitation is an aesthetic discourse-a set of "global riffs"-that is activated and appreciated in a variety of musical media, from the group singing of praise songs, called sholawat (A. salawat), to polished professional productions of Islamic music videos or, as they are known in Indonesia, video klips. Those individuals who recite, have studied recitation, or at least have had experience singing Arabic religious songs have special access to both the production and the appreciation of this Arab aesthetic. Accompanying the Arab musical aesthetic in Indonesian Islamic performance are musical discourses that are rooted in regional folk traditions (many of which are seasoned with Arab, Malay, Indian, and Chinese spices), cultivated court practices, arts education institutions, government festival and fanfare, indigenous popular musics, and the global music media. Following conventions of Western scholarship, I use the term music to refer to that which is musical. In any discussion of Islamic music, however, it must be acknowledged that the word music (I. musik; A. musiqa) usually connotes instrumental music or singing that is accompanied by instruments. In the course of my interaction with performers and their publics I have even heard the term musik used to refer to the instruments themselves, as, for example, in the expression "Apakah kita pakai musik, tidak?" (Shall we use instruments or not?). A further nuance of the music/nonmusic distinction is that the use of percussion instruments or their addition to singing does not automatically push that performance into the category of music. A de facto indicator of metricity, the use of percussion instruments (membranophones, idiophones, or even body percussion such as clapping) adds another layer of musical texture involving the organization of meter, tempo, and usually patterned form to sung melody. However, the use of percussion to accompany song and to add aspects of metricity, form, and style is a feature of religious music in many parts of the Islamic world, and frame drums are a key component of Sufi musical practice. Thus an ensemble of singers who accompany themselves with percussion instruments does not necessarily constitute an objectionable category of music in many Islamic contexts. It is clear that the distinction between song (I. lagu; A. ghina) and music with instruments (I. musik; A. musiqa) is operative in Indonesia, and that in certain contexts-for example, the hafla al-Qur'an at the Jakarta Islamic Center, which I describe in chapter 3-instruments, even the rebana frame drum, are thought to be inappropriate. But in the vast majority of the situations I witnessed, the presence of music (that is, song with accompaniment by both percussion and melody instruments) is generally accepted and enthusiastically appreciated among people in the business of religion. Thus my interest in music, my profession as a musicologist and practicing musician, and my frequent use of the term "music" in public presentations and throughout the course of my fieldwork among Indonesians was never problematic. Although my original intent was simply to study the culture of the recited Qur'an, I found music to be a part of almost all of the rituals, programs, competitions, and festivals to which I was invited. In addition, I quickly discovered that the performance of music, often with dance, is a multifaceted and very conscious category of constructive creation and consumption among the religious specialists and practitioners that I came to know and their audiences. The manifestation of many kinds of musical performance-from ritual chant to group singing, staged concerts, marching bands, and theatric choreographies-considered to be "Islamic" in Indonesia bumped up against the boundaries that I had previously learned were normative, albeit contested, regarding music in Islamic contexts (see, for example, works by Nelson, Shiloah, and al-Faruqi). Recitation is not music, as any number of sources will attest. Furthermore, the term music, as understood in the English language, does not begin to represent the real differences and conceptual nuances between song, instrumental music, and musical function that operate in languages other than English and within Southeast Asian and Middle Eastern Islamic milieus. With these distinctions carefully respected, however, this book describes a world in which qur'anic recitation and "musical" performance (both vocal and instrumental) exist side by side and are sometimes made by and for the same actors. Additionally, this discourse on music-including musical styles, repertoires, performers (male and female), instruments, and contexts-is explicitly connected to the exploration and expression of multiple Islamic identities in contemporary Indonesia. Readers interested in the performing arts of the Muslim Middle East and Asia will recognize that this is not an original scenario; the Muslim world is replete with musics that are related to religious ideology and praxis. This account is meant to complement and expand the evidence we have, both historical and contemporary, of musical practice in one area of the Muslim world and to explore the routes and roots of these ideas and practices within and among Muslim world communities. Reciters were generally enthusiastic about music and recognized the social processes inherent in music making and its reception as positive. On many occasions they were keen to demonstrate their knowledge of Arab music and to point out that both the musical techniques and the aesthetic spirit (ruh) of Arab music were one and the same with qur'anic recitation and related genres of solo and group singing. Although the community I came to know was aware of other kinds of Indonesian music, its members generally were not involved in the Indonesian music that is best known outside the archipelago, the impressive gamelan ensembles and the related arts of dance and musical theater such as wayang kulit (shadow puppet theater), wayang golek (puppet theater with rod puppets), and wayang orang (dance drama). In spite of the reciters' apparent disconnection from Indonesian classical or traditional music, however, the Islamic music that reciters did embrace or at least acknowledge usually reflected local musical aesthetics and techniques as well as elements of Arab music, language, and culture. One of the unique aspects of Indonesian Islamic music, in fact, is its combination of two very different musical systems: that of island Southeast Asia and that of the Arab Near East and Arabian Peninsula. Scholarship on both Indonesian music and that of the Arab world and the Middle East is vast; the following section is meant to provide a brief outline of some of the striking differences between these two musical worlds and, in some cases, to point out where they overlap. Percussion ensembles, whose musical textures are characterized by interlocking parts created by the performance of complementary ostinato patterns of musicians who work cooperatively, characterize many of the regional musics of Indonesia. The Indonesian music that has received the most scholarly attention, that is best known outside the country, and that has been successfully institutionalized in the country's national arts academies and conservatories is gamelan music. Integrally related to singing, dance, drama, and puppet theater, gamelan ensembles are comprised mainly of bronze metallophones, knobbed pot gongs, and large hanging gongs. The intricately carved and brightly painted or stained frames and trough resonators that support the heavy cast-metal idiophones are as impressive as the instruments themselves and are an integral aspect of these majestic ensembles. Various kinds of gamelan ensembles exist. The gamelan degung of West Java, for example, includes about seven instruments: a gong, two sets of kettle gongs, two kinds of metallophones, drums, and a suling flute. Various kinds of gong kettle ensembles in West Sumatra include talempong, which are played by one or two players who are seated behind a row of kettle gongs atop a rope lattice, or by several musicians in processions who perform in hocket to create interlocking melodic patterns. The magnificent gamelan ensembles of Java and Bali have been the most influential within and outside the country. Although the musical repertoire and the instruments of the ensembles themselves are quite different, the musical life of Bali was originally connected to that of Java during the Majapahit empire of the mid-fourteenth century under its leader Gajah Madah. When the Hindu-Javanese court of Majapahit fell to Muslim powers centered in Demak toward the end of the fifteenth century, many Javanese Hindus fled to the courts in Bali. It is from this point that Balinese and Javanese gamelan developed separately despite their common roots. Through conversion to Islam, music and related arts were adapted to Islamic ideology and practice in the Javanese coastal areas such as Demak and Cirebon, as well as in the important courtly centers of Yogyakarta and Surakarta, which were established in the seventeenth century. The largest of the Javanese gamelan ensembles includes two full sets of instruments for the two tuning systems slendro and pelog. The slendro scale is a pentatonic scale comprised of five roughly equidistant tones, whereas the pelog scale is made up of seven tones whose intervals range from smaller than the Western halftone (e.g., the distance between the notes C and C#) to nearly a whole tone plus a halftone (e.g., the distance between C and D#). While slendro and pelog scales are found consistently throughout Indonesia, the exact tuning of these scales, including the tonic note and the intervals themselves, vary, even from ensemble to ensemble within the same city, comprising a completely unique approach to tuning and temperament. Another completely distinct characteristic of the gamelan ensemble is the way that time and form are organized and controlled. Gamelan music is said to have a colotomic structure. In other words, compositions are cyclic rather than linear in form: metallophones generally play the skeletal melody that repeats over and over, the larger kettle gongs and the huge hanging gongs punctuate that melodic cycle at regular intervals, and smaller metallophones, pot gongs, and a handful of non-metallophone instruments (the wooden gambang xylophone and the stringed kecapi, or plucked zither, for example) play elaborating patterns. Tempi or, more accurately, tempo levels called irama are controlled by the drummer, who leads the group through a series of shifts in form and density. As the skeletal melody slows down, the elaborating instruments multiply the density of their phrases, creating an ever-busier texture as the irama level increases. The impressive ensemble of tuned bronze percussion is rounded out by the bamboo suling flute, the two-stringed bowed spiked fiddle, the rabab, the kecapi, and singers. With the exception of the distant and somewhat legendary connection of the Wali Songo to these court musics and the infamous gamelan sekaten, a special set of instruments brought out and performed on the Maulid (the birthday of the Prophet Muhammad), the culture of gamelan music is considered to operate and to have developed outside the realm of Islam. The assumption that the gamelan culture escaped Islamic influence is challenged by the mere presence of these kinds of instruments-the flute, bowed lute, and plucked zither-all of which exist in numerous varieties throughout the Near East and Central Asia. Not only are these instruments related to their cousins in name and construction, but the performance practice, especially that of the flute and fiddle, are remarkably similar to performance styles in the Near and Middle East. Rather than contributing to the cooperative interlocking texture created by the majority of players in the ensemble, the melodic lines of these instruments, as well as of the female singers (the pesinden), hover above the remarkable metric regularity in free heterophony that is not harnessed by the discipline of a regular beat. Furthermore, the timbres of these instruments and that of certain singers' voices is also akin to the timbres produced in Middle Eastern music. For the most part, however, the ensembles and performance practice of Arab and Middle Eastern music are remarkably different from those of Indonesia. The earliest musical influences on Indonesian music from Arab cultures certainly came from the Arabian Gulf region, but with the advent of mass media in the twentieth century, most of the musical influences from the Middle East have been from Egypt and the eastern Mediterranean or the Levant. This is a music culture that is indebted to the historical developments of Mesopotamia and the cosmopolitan traditions of the Persianate world during the so-called Golden Age of Arab civilization (the ninth through the thirteenth centuries), as well as to Ottoman culture, which was the dominant cultural force in the region from the sixteenth century onward. Most scholars and performers of this music agree that vocal artistry, from the singing of epic poets to the cantillation of the Qur'an, is the central pillar of this musical system and that even an instrumentalist's approach to monophonic, soloistic melody (without chords or polyphonic accompaniment) is informed to a great degree by the voice. Instruments in the Turko-Arab and Persian worlds are small and portable and, with the exception of double-reed folk oboes and drums, have delicate timbres. Ensemble music in these traditions happens indoors in private contexts for and by professional and amateur connoisseurs, a social factor that has been shaped by the skepticism surrounding public performance of music in Islamic culture. Bowed fiddles (the rabab and kemanche), plucked lutes (the 'ud and various long-necked lutes, such as the saz, buzuq, and tanbur), lap zithers (like the qanun and santur), end-blown flutes (like the nay), and a wide variety of drums and frames drums are usually played in small ensembles of no more than five to ten musicians. The large orchestra (firqa) is a twentieth-century development influenced by the Western European orchestra and electronic mass media. Instrumentalists in the small ensemble or takht, which includes just one musician on each instrument, all play the "melody." Melodies can be short and repetitive, particularly when used for the strophic songs, or they can be quite long and through-composed, incorporating very little melodic material that is repeated. Although musicians in an ensemble play the same melody, each one is free to interpret it with certain variations and ornaments, together creating a texture that musicologists refer to as heterophony. Solo improvisation in free meter, often unaccompanied, is a hallmark of this music, and it is here that the system of melodic modes comes into play. Arab, Persian, and Turkish musics all have their own modal systems that recognize hundreds of separate scales and the manner in which each individual scale is executed. Knowledge of these modes is demonstrated most deftly through the art of improvisation, or taqasim, a subject that is taken up more thoroughly in chapter 3. Women, the Recited Qur'an, and Islamic Music in Contemporary Indonesia takes readers to the heart of religious musical praxis in Indonesia, home to the largest Muslim population in the world. Anne K. Rasmussen explores a rich public soundscape, where women recite the divine texts of the Qur'an, and where an extraordinary diversity of Arab-influenced Islamic musical styles and genres, also performed by women, flourishes. Based on unique and revealing ethnographic research beginning at the end of Suharto's “New Order” and continuing into the era of “Reformation,” the book considers the powerful role of music in the expression of religious nationalism. In particular, it focuses on musical style, women's roles, and the ideological and aesthetic issues raised by the Indonesian style of recitation. Anne K. Rasmussen is Associate Professor of Music at the College of William and Mary.